I now have about month of summer between me and what was without question the most challenging year of my teaching career. To put it bluntly: this year was emotionally exhausting, physically draining, and forced me to drastically lower the bar for what a successful, productive teaching day looked like. So, I'm writing this post at least in part to try to take a step back and wrap my head around what went on this year, and hopefully raise that bar once again. I've taught science in private schools for nearly a decade, but this was my first year in a New York City charter school. Setting aside the politics of charters for a moment (this post won't be about charter schools, but there are interesting perspectives here, here, and here), this school gave me a chance to refocus my private school experience on students from a very different background. In this sense, my year was a rousing success – I floundered and drowned and through drowning got some much needed perspective on what I'd taken for granted in those very privileged environments where I'd previously worked. While it seems obvious to me now, I don't think I could have identified this a year ago – everything that I try to do in my classroom hinges on something we rather unassumingly call motivation. If you haven't ever seen it, or if it's just been a while, take a moment and watch or read the late David Foster Wallace's amazing 2005 commencement speech at Kenyon College. 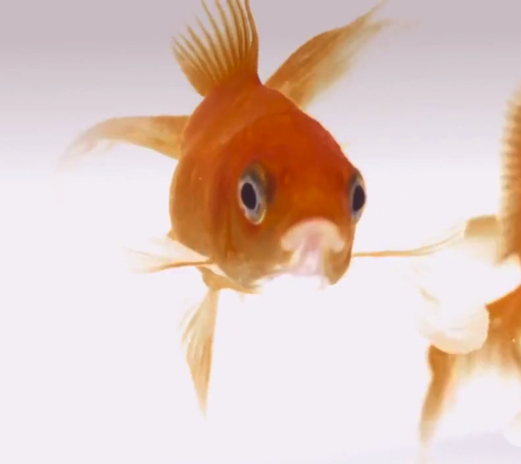 Like the fish who asks, "What the hell is water?" I as a private school teacher had no perspective on the fluid of hyper-motivation that I was swimming in. Only now, having tried swimming in some very different water, have I begun to get some perspective on the very thing that buoyed up those hours of lesson planning and worksheet formatting and helped my students (and me, of course) feel successful. Foster Wallace uses the water analogy to suggest that "the most obvious, important realities are often the ones that are hardest to see and talk about", and I believe that it's helpful to see the landscape of motivation in a classroom through this lens. Some of my students this year were quite driven academically – motivated in a similar way to many of the students I'd encountered at past school, and these students tended to earn straight A's in all their classes. But the majority of my students felt very little motivation to do the things I suggested would help them succeed – or, at least, they expected this motivation to originate in me, their teacher. If your response to this realization is, "Sounds like you're just describing good teaching!" you're not wrong. But my goal in writing this post is to ask why the motivational tools that have been successful for me in the past all of a sudden fell so flat, and ultimately to think more carefully about what can replace them in this new environment. It struck me early on that, at this school, one extremely effective technique for motivating students was to earn their devotion – to convince students to work for their teacher out of love and allegiance. It makes sense to me how this would emerge in a "high-stakes" climate (like the middle schools in my charter network), where consequences for poor performance on a state-standardized test will often affect the teacher more concretely than the student taking the test. This year I've been envious of the knack that some of my colleagues have for earning students' devotion. At the end of the year, after regular classes had ceased, two ninth grade math teachers hosted a jam-packed (voluntary) review session for the Algebra I Common Core Regents test. Peeking my head in, I noticed that a few students who had barely eked out a passing grade in my class had made the choice to be there, working on math when they could have been doing anything else. This says something spectacular about those teachers. For me, earning devotion from students through charm and affection has never come naturally. I admit that I have some work to do to hone these chops and give myself the power to call upon this technique, but the technique itself also raises some deeply problematic implications for students down the road. A few months into this year, a colleague overheard one of my students say, "I heard that in college, teachers don't care about you and don't even know your name. There's no way I'm going to do work for any of those teachers..." If success is going to be sustainable, don't students need to be working for themselves, rather than working for someone else? What does it mean to work for oneself? Sure, it seemed like my students at previous schools were self-motivated, but perhaps this was just a product of extrinsic motivators more deeply intertwined with life at school, around their neighborhood, and in their home – the water in which they swim? For now, this is my best stab at thinking about what it means to work for yourself. This question is obviously important but deeply complicated, and I imagine I'll be puzzling through it for years to come, but some challenges inherent in the question are obvious. If anyone is going to be convinced that the promise of a $60k starting salary ten years down the road is worth the choice to prioritize tonight's homework, they need to first believe that this path isn't just an illusion in the first place. I fear that many of my students don't believe this path actually exists for them, and the reasons for this go far beyond the walls of my classroom and one charter school. As I think more carefully about what can change next year, I feel confident coming to two conclusions. First, when I or my students fall short of my expectations, it will help me to try to think directly and honestly about what role we as individuals actually played in that failure – how much was it about us fish (me included) and how much was it about the water? Second, while it may be possible to change that water, this change isn't going to come from a better designed worksheet, or a more effective paradigm lab for uncovering Newton's Second Law. My best hope is that it's going to come from giving kids a chance to feel their own inspiration to work through things they find challenging, and experience first-hand that this hard work can actually translate into success. 1 Language education researchers seem to agree that integrative motivation is a much better predictor of success – that students are most likely to acquire language skills if they "like the people that speak the language, admire the culture, and have a desire to become familiar with or even integrate into the society in which the language is used." (Falk, J. 1978) I can think of my ninth grade physics class as process of learning how to speak a new language of models and representations, and learning to converse and debate through this language. If I want students to learn the language I'm teaching, don't they need to like the people who speak the language? As the only person who speaks the language in the room, I'm basically an ambassador for science... so I'd better be darn likable. The class website described here is one example of a successful site that seeks to maximize student access to useful resources while minimizing updates to the site itself. This website can be easily transferred to a site for use with another class, either by requesting a duplicate copy of the template site, or by applying any individual technique to a site that's already built. This is the second year that I've made heavy use of a class website that attempts to host all the resources that students might find useful in the course. Next year I'll be moving on to a new school, and while I plan on taking the template for the site with me, I'm hoping that the current site can remain useful to folks that will be teaching the course I've taught this year. I figured I'd write a quick synopsis of everything that makes the website tick, both as a resource for teachers at my current school and anyone else who wants to use the site as a template. If the basic format of what I've described below seems useful, just contact me by on twitter or by email (josephlkremer at gmail) and I'll happily make a copy of the site for you! Thankfully, Google Sites makes duplicating sites extremely easy, so don't hesitate to ask if you'd like to use the template as a starting point. Click here to see a template of the site I used with my Modeling-based Physics First class. The real success of this site is in the simplicity with which I'm able to update content that's most relevant to students. As the class moves forward and students generate new ideas, I rarely have to make changes to the guts of the website itself to give them access to the information they need. The breakthrough here was to think of the website not as a repository for materials themselves, but as a central hub through which students access these materials. On the right side of the homepage, I've made a dedicated page for each unit/model, and filled it with a few useful links, photos, and videos. I've tried to make these pages full of useful and relevant materials, but I'm not sure how much my students use it at all... Most importantly, these unit pages make it easy for students to access any handouts from class whenever they need them, from their computer or smartphone. To accomplish this, I create a folder in Dropbox for each unit, and save a PDF copy of every handout in these folders, unit by unit. On your main Finder (for Mac) or Home Directory (for Windows, right? ), right click on this folder and click on "Share Dropbox Link". The "Public Link" for this folder will be copied to your clipboard, and you can paste it as a link to at the top of each unit/model page. To make a new handout available to students, I just print a copy to PDF in the folder for that unit. To update a handout, I just write over the PDF file in that folder and the updates show up automatically. With this system, I rarely have to make changes to the website when I make small changes to handouts. Thanks to Joe Morin for his Dropbox tip above - the old "Public Folder" sharing method I'd been using was outdated and much less convenient! On the iPhone, Apple's "Photo Stream" provides a convenient way to share photos of whiteboards and lab activities from class in one consistent location. (If you know of a way to do this on other platforms, please let me know in a comment and I'll update this post.) To set this up for the first time, go to the Settings app, choose Photos and Camera, and turn on My Photo Stream and Shared Photo Stream. To share photos from your class with iOS7, go to the Camera Roll, click Select in the upper left, and choose a few photos. Click the box and arrow icon in the lower left, then choose iCloud. The first time you set it up, make a new Photo Stream for the class you've chosen, and give it a descriptive name. After this, simply choose the appropriate stream to add more photos to the collection. To make the Photo Stream publicly available online, you'll need to turn on the "Public Website" option. Go to the "Photos" app (not the camera, the app that's actually called "Photos"), choose the "Photo Stream" tab, and click the arrow next to the name you just created. Switch "Public Website" to "On", and share the link with yourself. This link can then be used as the permanent link from each section on the class website, under the "Class Photos!!" link. Click the pencil icon in the upper right to edit the page and change the links to your own Photo Streams. The steps are the same in iOS6. Try this support page if you get stuck. Students can access examples of whiteboards from their own section or others, and it's easy to separate sections from each other while giving students a chance to browse work from other sections as well as their own. My AP Physics class had 224 photos by the end of the year! I've also used the Photo Stream to post solutions (one by one) to practice problems for a "Rally Coach" Kagan Structure - one student is working on a problem while their pair coaches them through the solution while looking at a suggested solution online - using a smartphone or computer. Skills Based Feedback (or Standards Based Grading as it's more commonly known) has been a crucial part of giving my students the incentive and autonomy to focus their attention where they need it most. I've used the class website heavily to make this information students need most easy to find. Skills are grouped in clusters, arranged by quiz (while I give a few tests throughout the year, new skills are almost always assessed first on a quiz). For each quiz, students have access to an "Extra Practice Sheet" for practicing those skills explicitly, as well as a suggested solution. Once a student has completed and checked their work on this practice sheet (and talked to another person about their work), they can submit a Google form that automatically sends me an email containing that student's "Extra Opportunity Request." I can prepare this reassessment for the student, and they can show their improvement on those skills. The website serves as a hub for all aspects of this system. Students can see their current skill grades, download practice sheets and suggested solutions, and submit online forms to tell that they're ready to show their improvement, all from the "Skills and Extra Opportunities" section of the site. Current feedback is updated similarly to handout in the unit sections, via Dropbox. (Instructions on how to create a public link can be found here.) The Skills Feedback link at the top of page itself goes to a public link for a PDF file called SkillsFeedbackSheet. By writing over this PDF, I automatically write over the file that shows when students visit this link from the page. Thanks to Paul Bianchi for sharing the Excel Spreadsheet that I use to make keep these skills grades organized. If you'd like more info on how this sheet is organized, drop me a line! Extra Practice Sheets and suggested solutions for each quiz type, or group of skills, are also accessed via Dropbox public links, making it easy to update the files as needed without making any changes to the website itself. Unlike the files on the unit page, these have to be linked one-by-one, but if your skill groups stay consistent from year to year, this will only have to be set up once. Extra Opportunity Forms can be submitted directly from the page. Setting this up for yourself will require first making your own Google Form (feel free to use this one as a template), then editing the page so that your own form is embedded in the page. Once you've created your form go to the Live Form page, and copy the link in the URL bar. While editing the page, scroll down to the form, which will appear as a grey box. Click on the Properties icon to the left, and paste the link to the form in the box marked "URL to content". One last Google Forms trick, for experienced users: I got sick of looking back at the form responses to see the details on each form submitted, so I modified a script to send me an email with the contents of the form whenever a student made a submission. This is pretty handy if you're getting a lot of forms! A tutorial on how to create this script can be found here, though I found that it took a little bit of troubleshooting to get it working correctly with multiple email addresses for different teachers. For each unit/model in the course, I create a collection of collectively editable Google Docs, where each document contains a few discrete topics within each unit (BFPM 5: Force Pairs, BFPM 6-7: Components and Analyzing on an Incline), duplicated for each section of my class. Students contribute suggestions of useful notes, ask and answer questions, and post photos of relevant examples (often pasted in from the Photo Stream described above). I'll browse contributions every few days and make my own suggestions, or point out which suggestions I think are especially helpful or problematic. Since each student has an email address that's linked via Google Drive to the document itself, I can send a comment directly to the inbox of the student who wrote a post, asking students who wrote questionable or incomplete suggestions to revise or add to their previous work, simply by adding "+name@address.com" to the comment. As the sections grow to include suggestions of various degrees of usefulness (to put it kindly! ), students need to evaluate the suggestions to determine what's most useful for them. Students keep a paper notebook with the same hierarchical organization as the online documents. Each student individually combs through the examples and suggestions in each section, and decide for themselves what's important enough to write down in their own notebook. While some notes are taken in class, most of the reflection what information is useful happens outside of class, when students have time to think about their work, and identify which suggestions from the online doc they find most helpful to write down in their spiral bound paper copy of the Consensus Notebook. I hope that this template can be a nice jumping off point for folks who might otherwise be reluctant to start a class website, and that the tips I've stumbled upon can help the savvier teachers improve and streamline a site that's already up and running! Do you have any other suggestions of simple ways to make a website easy to use for both teachers and students? Do you have questions about the various aspects of the site described here? Let us know in a comment so we can get a conversation started! I've been looking for a while for a way to watch YouTube videos frame by frame - to encourage rough quantitative analysis of videos directly online without loading them into a video analysis program like Logger Pro. I've had some success with encouraging students to measure position by putting a ruler directly on their screen - but until a few days ago it was quite difficult to get useful clock reading measurements from the YouTube player. This exercise is MUCH more powerful now, thanks to a simple online app called RowVid, originally created by Calum Eadie, Andrew Ratomski and Jack Lawrence Jones at an Entrepreneur First Hackathon to help rowers analyze training and race videos. Since then, it has developed into general purpose player for frame by frame and slow motion playback of any YouTube video. When I first stumbled across the player, I got in touch with Calum by Twitter and mentioned to him that the player would be even more helpful for physics classes if it displayed the clock reading of the frame. He made this modification in a matter of hours - AND included in the display an estimate of the uncertainty of the clock reading! In a follow-up email, he mentioned to me that he's "keen to hear how it's being used and are very open to feedback from teachers on how to make it better. Get in touch by tweeting @CalumJEadie." This invitation is open to anyone, so please don't hesitate to make your comments and suggestions known! A ruler on the screen is perhaps not as accurate as point-by-point video analysis, but it's also much less black-boxish. Students are forced to declare their own reference point and positive direction by placing the ruler on the screen. They see first-hand how to think about a "reference point" when the camera is moving along with the subject, and forced to think about what reference lengths they might use in the frame to scale their measurements to usable values. In other words, they have to everything that they have to do in real video analysis software, but they have to do it by hand - and thereby come to terms with why these steps are important. Choose a sledder in the video. Is the CVPM useful for describing the sledders motion? 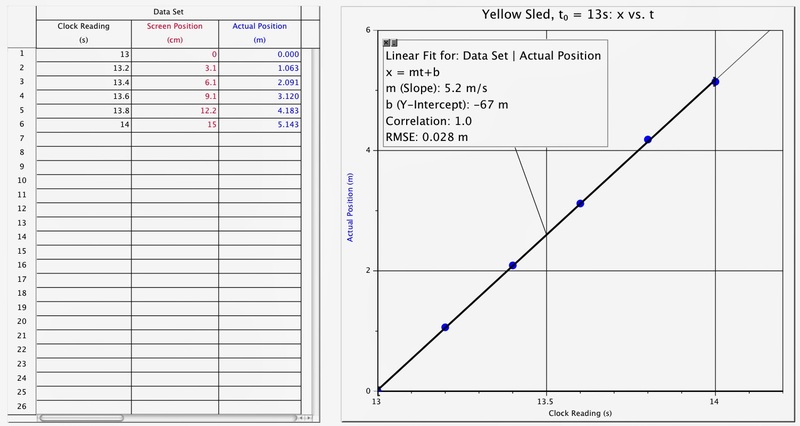 Collect and graph position data directly from the video to defend your answer with evidence. If you can, estimate the instantaneous velocity of the sledder at one clock reading. Now I can link directly to the video in RowVid's frame-by-frame player, so students simply click on the link to begin analyzing the motion. 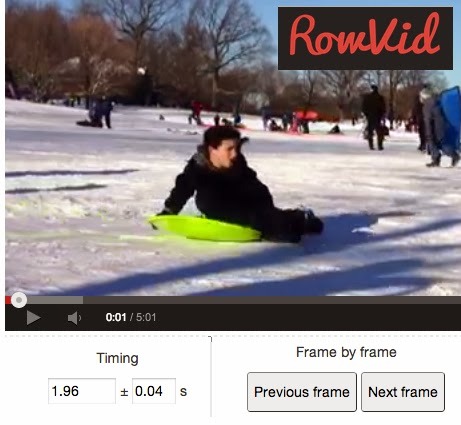 Here's a picture of me collecting data on the motion of a sledder in the video. I chose somebody on a yellow sled who whizzes by at about t = 13s. When I assume that the sled is about 1.2m long, I get a constant velocity of 5m/s for the 1s time interval. Seem reasonable? What applications do you see for frame by frame video analysis in your classes? Is analyzing "real-life" motion a theme in your class? What skills does this require that solving "constant velocity" problems from a book or worksheet don't address? FYI - RowVid is currently working on a version of the app focused specifically on the Sochi Winter Olympics. Let's hope that there are some clips where the camera is steady! Encouraging students to practice struggling has the potential to promote perseverance that can carry over into life pursuits unrelated to physics class. But the context in which this struggle takes place will influence whether students associate it with success or repeated failure, and this can have great implications for how they approach new challenges in the future. Since I first began teaching, I've tried to make "practicing struggle" an important element of my classes. This was partly a matter of necessity, since concepts would sometimes take weeks to develop and students would have to cope with "not knowing" answers to some very central questions as we slowly worked toward more sophisticated understanding. When I came across Modeling Instruction, it seemed to fit in nicely with this emphasis. I'd interpreted the focus of Modeling to be on building physics understanding from scratch through experiments and analysis, and I knew that this would take a lot of struggle and failure along the way. 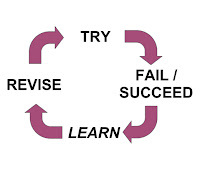 Invariably, I assumed, this would mean plenty of learning from failure, as well as learning to fail, along the way. I tried to emphasize this to my students again and again. After completing The Marshmallow Challenge on the first day of school, I posted the diagram on the right on the projector and we talked for ten minutes about what it could mean for our class. I included the diagram on a handout explaining my policy of standards-based grading. I taped a copy to the back of my gradebook, and I'd hold it up when new understanding was emerging from our conversation about a tricky new concept that no one had grasped the first time around. When I used a homework assignment to introduce for the first time a problem that required a new concept or technique, I emphasized that students' only responsibility was to TRY. Even if they didn't necessarily SUCCEED or LEARN much the first time around, we'd struggle in small groups and struggle as a whole class until we'd figured it out. But to my great dismay, most didn't seem to become any more comfortable with approaching new ideas in this way, even after months of practice. I've long been convinced that Physics First is as much about teaching critical thinking and problem solving skills as it is about teaching physics, and perseverance through confusion and frustration is clearly a crucial part of this. I'm certainly not alone in focusing on how we might better develop such character-related skills. Some schools have gone so far as to issue character report cards to assess how these traits are developing, encouraged by psychologists' study of the predictive power of traits like "grit" on performance in and after college. By assigning homework containing material that students hadn't worked with in class, I hoped that I was giving students an opportunity to practice their perseverance, and thereby develop "truer grit." But morale among my students was quite poor much of the time, and the pace of the class has been extremely slow. For a while, students frequently expressed frustration that they never knew what to do on homework, that they were endlessly confused, that they couldn't tell when we reached consensus in class discussion, and worst of all that they couldn't even tell when their own thinking was on the right track. It isn’t of any use for those who don’t understand what they’re doing. Such homework makes them feel stupid; gets them accustomed to doing things the wrong way (because what’s really “reinforced” are mistaken assumptions); and teaches them to conceal what they don’t know. However, many of my students in the "Regular" physics sections lack the perspective to recognize when they need more practice, or the maturity to prioritize this practice when it's not due the next morning. Required homework, if it's not graded for correctness, can provide some much-needed guidance and scaffolding of how one might spend time effectively outside the class. I agree with homework critics that busy work promotes a false sense of security (or worse), but for a ninth grader, total freedom to choose when and how to engage with a course can be quite crippling. My students were generally embracing the guidance I was trying to provide, but despite my best intentions it was clear this guidance wasn't nearly as effective as it could be. Rather than teaching students that struggle could be rewarding, valuable, and even enjoyable, I seemed to be teaching them to dread encountering a new idea for the first time. In my simple sequence of 1) personal struggle, 2) small group struggle, 3) whole class struggle, the most confusing and difficult stage of the process has been taking place in an environment where a student can feel alone, insecure and vulnerable. In this context, individual struggle comes to be associated with fear, anxiety, and anger (the list goes on), all of which are detrimental to real learning. If my goal is to teach students to be comfortable with their confusion, this initial stage has to come in an environment they have a fighting chance of actually building confidence. Working with others in small groups is beneficial not only because more ideas are brought to the table, but also because students see others like themselves break through from confusion to understanding. But solidarity can cut both ways: students can band together to work together to puzzle through a new idea, or they can feed off each other's anxiety and confusion. This stuff doesn't make sense to anyone... Why should I even try? is a fire I've had to put out many times this year, but it's almost always come at the beginning of a class period, when students have all wrestled with a challenging new idea on their own the previous night. This is not to say that students shouldn't be asked to struggle with new ideas on their own - quite the opposite. If struggle is going to be developed as an individual skill, students have to practice struggling individually. To some extent, this will happen with a well-designed practice assignment, where students have to apply and expand on work that began in class when tackling a new problem at home. Moreover, after students have practiced struggling "class first" for a few months (or more, depending on the students), they may build up confidence that can be directed toward working with brand new ideas on their own as well. We want students to embrace and enjoy the process analyzing a tricky new situation in an inquiry-based physics class. Since the first stages of this process can sometimes resemble a game of pin-the-tail-on-the-donkey, it's reasonable to think that the teacher should be there to at least point them in the general direction of the donkey and put the tail in their hand, or that other students should be there to offer suggestions and cheer them on. I'm convinced that the ability to work through confusion and emerge with better understanding is a skill to be honed through repeated practice, and I've come to see that the early stages of this practice are crucial in the development of the skill. 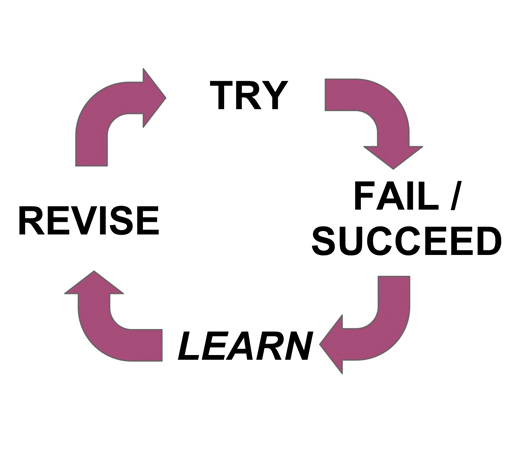 But if students are going to embrace the cycle of "TRY - FAIL - LEARN - REVISE - SUCCEED" they need to associate their struggle with success, not repeated failure. Otherwise, there's simply no incentive to bring themselves to new physics assignments again and again. Worse yet, there's no chance of building perseverance for life pursuits that will take much longer to develop than any physics concept. There's also a companion video which shows the force meter readings for 65 mph, so a student who makes the prediction could then check it against actual measurements. I included a link down below1, but I recommend collecting the data and making the prediction yourself before ruining the surprise! I've called it a VideoLab in conversations with friends. My hope is to create quite a few more of them this year. The relationship depicted here, of course, is less central to most introductory physics courses. We generally ignore air resistance precisely because it's messy, as the uncertainty in these measurements shows2. But I think it's actually pretty remarkable how even a system as gnarly and variable as this one can fit a simple model (as long as you give yourself some healthy error bars). In any case, the model of an "instructional video" that contains everything you need for collecting and analyzing quantitative data on a relationship could be quite powerful. It's no substitute for hands-on work, of course, but students who wouldn't otherwise have access to a proper physics lab (or simply missed class on lab day) could benefit greatly. Imagine if a whole slew of VideoLabs were accessible online... How 'bout it, folks? #videolab? There's at least one precedent for using video this way, in the wealth of videos created and hosted by Rutgers Graduate School of Education (where I am currently a student!). Each of the videos on this site is designed to serve as part of a cycle in which students observe a phenomenon, form a hypothesis that explains what they've seen, consider the implications that their hypothesis might have for further observable data, then make a "testing observation" to see whether what's depicted in the video agrees with the prediction they made. The video I've made here is similar, but my goal is more to present students with data that can be analyzed quantitatively, in a style similar to the analysis of data collected during a paradigm lab of a Modeling Instruction unit. I still plan on making a few more companion videos, including a qualitative "observation-oriented" video that could be used for asking, "What could we change? What could we measure?" before any instruments are shown. 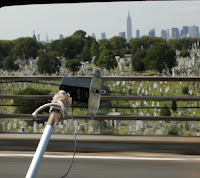 I have a lot of footage of stuff sticking out of my car window, and I want to make good use of it!! Maybe the next step is just to upload a bunch of raw footage set to a soundtrack of Empire State of Mind. Concrete jungle where dreams are made of... videos about air resistance! So that's how the line is supposed to end! 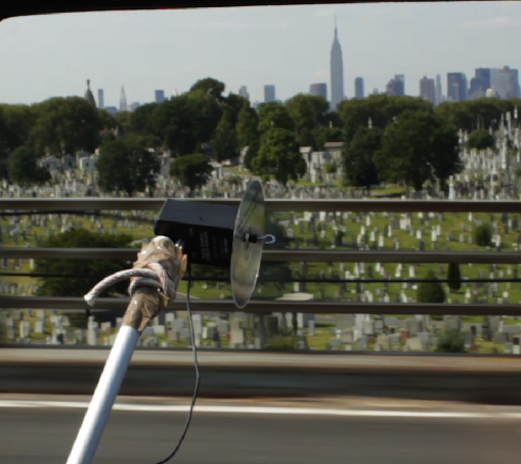 1 65 mph check video here! 2 I also did the same experiment with a flat disk instead of a plastic bag (a cd, as you can see from the picture above), but it's a lot less fun to watch and the numbers are no less messy. I'm planning on editing that together too though, for comparison's sake, when I get a moment. Khan Academy's new computer science platform is a refreshing deviation from the lecture-based curriculum resources previously offered by Khan, and has the potential to further encourage the exploration of programming as a tool for teaching creative problem solving. • Instructional narration is left off most videos. When narration is included, it's entirely optional unobtrusive for those inclined toward a more playful approach. Also, the narrator of the videos is a woman - isn't it about time we razed this CS boys' club to the ground? I've suggested before on this blog that programming can be an ideal environment for problem solving. 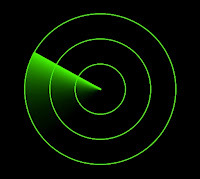 A programming environment offers explicit connections between cause and effect, provided the programmer is able to navigate a ruthlessly picky syntactical landscape. In other words, to succeed at programming, a student needs to both become familiar with the details of the language AND apply this language conceptually in creative ways to solve problems. The role of instructional videos in the pedagogical balance of concepts and processes is hazy, but this latest resource hits closer to the mark than anything I've seen from KA. Rather than demonstrating outright how to complete the task, my goal was to provide what a student might need to get started programming and troubleshooting. I tried to provide a concrete foundation for why the basic design of the program is valid, and to model good programming behavior in my presentation. (For example, I put the program together in small chunks, frequently testing the individual chunks to confirm that they did what I expected them to do, and I consulted the internet for the answer to a specific question about Python syntax.) It was interesting to me to compare my video to the new KA tutorial on if statements, since the KA tutorial does some things much more effectively than mine. For example, the KA tutorial targets the if command explicitly, making it a more efficient resource than my own somewhat rambling contribution.. More importantly, the KA tutorial introduces the NEED for an if statement before the introducing the command itself. This seems similar to the Modeling Instruction tenet of introducing and defining a concept before giving it a name. Some time ago, a math teacher in New York City created this excellent video, called "What if Khan Academy was made in Japan?" to contrast KA's "Watch. Practice. Learn." approach with a more effective "Struggle. Struggle. Learn." approach. That is, in countries like Japan and Finland, where math education programs are more successful than most programs in the US, students spend most of their class time working through difficult problems, rather than being told how to solve such problems by their teacher. At the end of the video, we're given an example of what a more effective instructional video might look like. The main takeaway from this video is that learning takes place when students struggle with questions, not when they sit through an answer. While it's clear that instructional videos are useful for absorbing procedures, they have questionable value as tools for facilitating real conceptual learning, and for this reason most of Khan Academy still stands at odds with inquiry education. Drawing a line between concepts and processes is perhaps easier in programming than in math, but the KA Computer Science platform is a refreshing change, even from previous KA programming resources. I'm still fascinated by the potential of programming to serve as a tool for exploring creative problem solving. I'm struck by the degree to which the environment adopted by KACS, which emphasizes the modification of existing programs over building programs from scratch, eliminates the need for a lot of direct instruction on programming language process. As KACS goes forward, I hope that we'll see more programs and tasks emerge, similar to how an educational community has been built up around Python. If the inspiration behind this branch of Khan Academy someday finds its way into the other curriculum resources they offer, Khan Academy users will be better served indeed. *A few of the introductory programs on the KACS site include prompts to Change this Program, but this is (for the time being) left off most programs. I'm not sure whether I think it'd be a good thing for these prompts to be a more dominant part of the KACS experience. Certainly it would make for a more self-contained curriculum, but it may also excessively limit creativity. I guess we'll have to wait and see whether this expands as KACS grows further. Any conversation about Physics First will tend to revolve around a few distinct motives, priorities, and assumptions. In order to communicate successfully about the benefits or limitations of inverting to a Physics First sequence, it's crucial to explicitly identify what we're bringing to the table in these conversations. 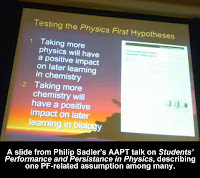 I recently watched online a recording of a fantastic talk given at the recent AAPT conference by Dr. Philip Sadler, this year's recipient of the Millikan Medal for "educators who have made notable and creative contributions to the teaching of physics." A very small portion of this talk is devoted to Sadler's characterization of what he called The Physics First Hypotheses: 1) physics knowledge can inform a study of chemistry and 2) chemistry knowledge can inform a study of biology. (A slide showing Sadler's wording is shown here.) This characterization of the potential benefit of Physics First is much narrower than my own, and it got me thinking about the motives, priorities, and assumptions that have come to be associated with an inverted science sequence. Sadler is explicit in identifying his own narrow interpretation of the term, but it strikes me that we rarely do a good job of clarifying exactly what we're talking about when we talk about Physics First. The focus of this blog has been to investigate more closely the diverse mix of ideas that get lumped together under the Physics First umbrella, so it seems useful to try to summarize some of this diversity explicitly in a single post. In the paragraphs below, I've tried to characterize a number of ideas often linked to Physics First, along with a few personal thoughts and reactions about each. I'm sure I've missed some stuff here, so please get in touch (via comments, email, or Twitter) if you can suggest anything that should be on the list! A. Physics for All: Many schools that have implemented Physics First offer physics as a required course for all ninth graders. Rather than a physics course taught only to self-selected, highly-motivated students, physics as a required course means that physics is taught to all students. Among folks who are passionate about physics this opportunity to reach more students is one of the most popular arguments for Physics First, but it requires conceiving of the physics course as a fundamentally different classroom experience. I'm convinced that this is an extremely good thing, but it makes some traditionalists nervous. Though most Physics First schools offer physics for all, some instead offer physics as an "Honors" option for students who have passed out of a ninth grade biology course (or have otherwise demonstrated a capacity for high-achievement in science). In my limited experience such courses tend to be taught in a more traditional, lecture-based style. D. Physics is a Foundational Science: The classic biology uses chemistry and chemistry uses physics so teach physics first line of reasoning is probably the most common argument for inverting the BCP sequence, and in my opinion the least salient. Though Sadler's data are are only questionably connected to the Physics First discussion,3 they do show that content knowledge in physics (at the novice level of an introductory student) doesn't seem to translate to greater success in biology and chemistry. Whether this is because of too little crossover of content between these respective courses or simply because of a disconnect in representation and terminology, it's clear that simply having taken a physics course will not, statistically, impact an individual's success in a chemistry or biology course. E. Inverting the Sequence Can Spur Pedagogical Change: My most recent post identified the potential for inversion to a Physics First sequence to bring about greater change within a science department. I argued that, since inverting a sequence necessitates changes to all high school science offerings, greater cohesiveness throughout the high school science curriculum can be achieved. A similar argument can be made within the physics class itself. A transition to Physics First is an opportunity to upset the status quo at a school, and can serve as incentive for teachers accustomed to using lecture-based instruction to try something different and potentially more effective. F. Physics Helps Develops Scientific Reasoning and Critical Thinking Skills: Some physics curricula, such as a those built on ASU's Modeling Instruction or Rutgers University's PUM (Physics Union Mathematics), are based on the notion that students can only effectively learn science by doing science. The relationships, representations, and conceptual understanding in each unit of the course are built from the ground up by the students themselves, through analysis of empirical evidence and class consensus arrived at through discussion. Aside from being an effective method of teaching physics (no small thing, of course! 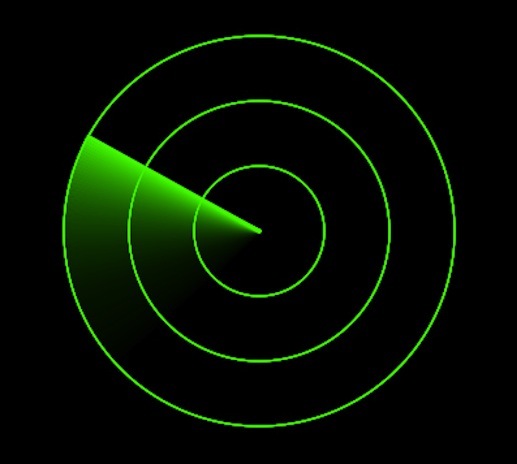 ), this approach instills in students the unique supremacy of empirical observations. In other words, students learn that evidence matters. Physics is especially suitable for a course in "evidence-based problem solving" because the systems and relationships we study can simultaneously be both gorgeously simple and puzzlingly counter-intuitive. Not all science teaching methods emphasize this skill, but some methods do, and a transition to Physics First presents a golden opportunity to transition to using such a method (see motivation/assumption E). In my opinion, this last motivation is the single strongest argument in favor of both inverting a curriculum to Physics First and teaching physics to all students. By designing and analyzing experiments, students learn a scientific approach to problem solving - not just a figure out how far the ball goes type of problem solving, but a broader and more relevant figure out whether this pill can do what it says it does, figure out whether this politician can do what he/she says he/she can do, or figure out how to turn this rope into a rope swing type of problem solving. Students learn to always look for relevant evidence, and to be thoughtful and critical in interpreting that evidence. They learn that failure is an essential part of any problem-solving process, and that successful problem-solvers keep an open mind as they learn from their mistakes through repeated trials and errors. They experience first-hand the immense benefits and inevitable challenges of collaborative work. In designing a syllabus for a Physics First course with this emphasis, the question is not, "What physics content is essential for my students to know?" (As much as I hate to admit it, evidence suggests that zero physics knowledge is essential for leading a fulfilling life!) Instead, the question can be, "What physics content will be effective for developing critical thinking skills in my students?" What better time to start explicitly developing such skills than in ninth grade? 1: There is a subtle distinction to be made here. Students drilling quantitative problems involving graphs and algebra can often look similar to students using these same graphs and algebra as tools to solve a scientific problem or make a prediction. In some curricula intended for use with ninth graders, students might even develop those "drilling techniques" through small group and whole class discussions, somewhat similar to a scientific inquiry process. The difference, however, is in the students' motivation for doing this work - whether they're doing math for the sake of getting through the worksheet, or for the sake of building more sophisticated conceptual understanding. The best way to tell these apart, I'd say, is to look at what happens before and after the graphs and algebra: are students collecting data about a situation, then using the analytical techniques they've developed to make, test, and revise predictions, or are they just doing more algebra? 2: Paul Hewitt has said that he originally intended Conceptual Physics to be used with ninth graders. His publishers, he claimed, refused to promote the book as a Physics First course, since so few schools taught Physics First. Therefore, various different editions of the book have come to be used in courses for a variety of age levels, from middle school to undergraduate university students. 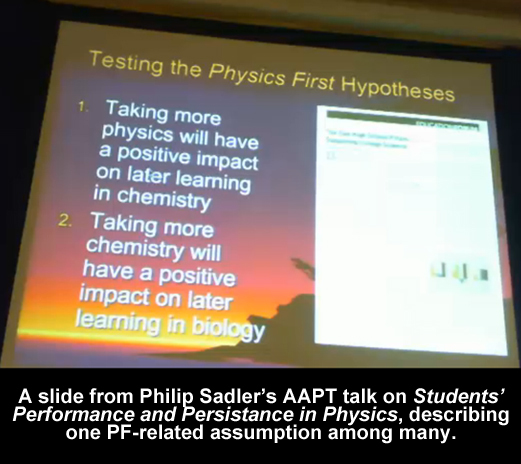 3: Sadler says in his talk, "We needed large numbers and there aren't large numbers of people who do Physics First. So what we looked at was how much of each of these sciences kids took in high school, and then used it to predict their college grades in these other fields." Though this approach may measure the conceptual connections between high school science courses and university level courses, it doesn't seem to me to be all that relevant to the potential benefit of Physics First. 4: I don't really know what we might use as an effective measure of gains in the rather ambiguous area I've identified as my primary focus, but I'm looking for something. A pill-purchasing or rope-swing-construction pre/post test doesn't really seem like the right way to go, so if you have suggestions, please include them in the comments below! PS: Tim Burgess' comment below should link to the following page - a great wealth of physics first research.